Jason tips us off to this PalmPreBlog post (welcome to the neighborhood!) with a twist on the standard "no comment' we usually get from customer service reps: a "no comment" with the added bonus "we are still in early negotiation with Palm, but nothing is solid." Add in the fact that another Vodafon rep chimed in in a forum stating that they were playing around with the Pre internally and you get what many of us expected: Vodafone will likely carry the Pre and it's a safe bet that they'll do so exclusively. Alright, so where are we getting this? We'll tell you after the break. So here's the deal: we've been following Palm for just shy of 10 years now, and in that time we've learned that Palm has great relationships with two carriers: Sprint and Vodafone. The Sprint piece is key -- they're picking up the Treo Pro soon when everybody else (including, yes, AT&T) took a flier on it, they carried the Treo 800w in the same vein, and they've not been shy about marketing the Centro either. In other words: Sprint has been good to Palm and vice versa, so Palm will want to give Sprint as much exclusivity as is reasonable. This is likely part of the reason that they've been so mum about the GSM side of the Pre. While Palm doesn't care about the Osbourne effect (where people hold off on buying current products because they're waiting for the next one) for their current devices, they definitely do want to make sure Sprint gets big big initial sales on the Palm Pre. If they let on that the GSM version, even locked to Vodafone, will be out at the same time as or even just after the CDMA version, there will be plenty of Palm loyalists who would hold off switching to Sprint for the Pre. Will the Pre see release on AT&T in the US? We are confident that it will. But we expect it will come well after both the Sprint and Vodafone releases. 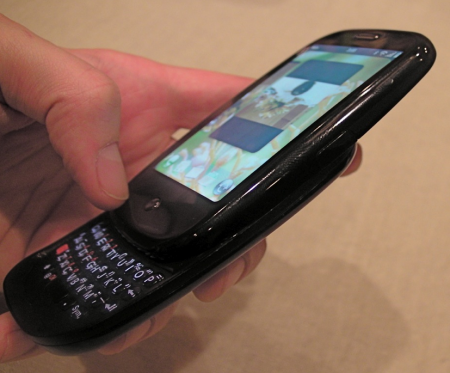 Again, we look to our long history following Palm -- that was exactly the situation with the Treo 700wx / Treo 750 releases. Sprint first, Vodafone next with a GSM version, AT&T last.